If you're looking for a last minute gift for that special someone and don't know what to do you may want to consider checking out SOUFEEL. I know it's too late for shipping to arrive by Christmas, but how cool would it be if you gave that special someone a "Create Your Own Bracelet" coupon! Let her visit the website and pick out the charms that she loves most to create the perfect bracelet she will always cherish. I know I'm pretty particular when it comes to my jewelry so my husband usually doesn't even try to pick for me anymore. SOUFEEL products are 925 sterling silver and if you already have a bracelet their charms even fit Pandora and Chamilia bracelets. One thing I really like about shopping SOUFEEL is that they have so many different ways you can shop on their website. You can shop by looking at individual charms/pendants and bracelets, or you can shop by sets if you don't want to take the time to pick out individual charms to get started. I thought this was a nice way to give them as a gift because you get three charms to start with and that's just enough to start a new bracelet. Then that allows the recipient to choose coordinating charms on their own, or for you to purchase other charms as a gift later even. I'm now on my second SOUFEEL bracelet and I have to say I love this one as much as the first. And this time I even made sure to get a stopper so I didn't have any issues with my beads falling off when I put it on or take it off. I've actually gotten a ton of compliments on it and people asking where I got certain charms from. 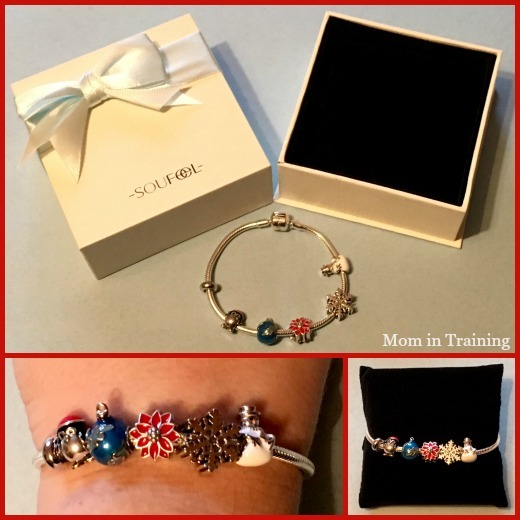 Shop SOUFEEL: Right now there are a ton of awesome deals on their holiday charms - perfect for building a winter themed bracelet! I've never heard of this brand before. It's really nice that they fit Pandora & Chamilia!